Cooking a traditional recipe always warms me up. I love the nostalgia it brings with it, I remember how my grandmother used to make it and then my mother and how all of us siblings would huddle up in the kitchen and be curious. No wonder all of us siblings (two brothers and three sisters in all) are foodies and great cooks. Though when it comes to try the more labor intensive and time consuming recipes it's yours truly who plays granny. And I love doing this and I love when I see happy faces around me. Food always succeeds in spreading happiness. 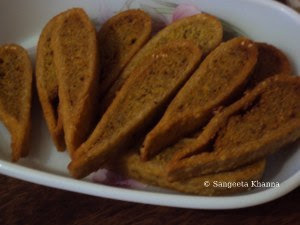 This goojha as we call it at home is a family favorite. 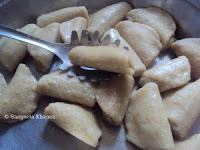 It is called fara (singular) or Farey (plural) or pitha in different parts of UP. 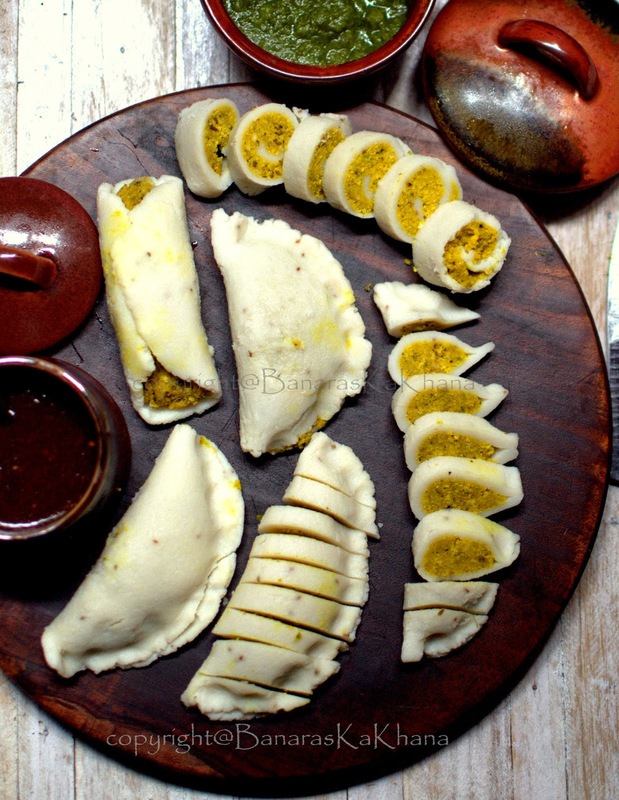 Bengalis make a sweet version of the same dumpling with a jaggery and coconut stuffing. I find the fara one of the many dumplings that are made in south-east Asia. Momos, steamed bao, Tingmo or siu mai are all staple foods wherever they are cooked and people find excuses to make such meals even in modern kitchens that trashes the belief that only junk fried foods are liked by all. I had promised this fara and many of you took interest in this ( I love you all for this )...... an anonymous reader (why anonymous?) said that he/ he will be happy to see if it is with the rice outer shell. I wanted to fulfill this wish so I made the rice flour at home, and tried to cook the rice dough which is a tricky process. Normally I just make a dough of 1:1 ratio of rice and whole wheat and that is good enough to make the fara shells. It took me the whole day rinsing and drying the rice, grinding it and then cooking the dough. Okay about 6 hrs to be precise. It was about about 2 hrs on the kitchen counter and the time spent, the muscle work done was all worth it. We got a whole lot of fara to last a week. To make the rice flour at home you need to wash the rice (I used basmati tukda or broken basmati) , drain well in a colander and spread it on a news paper to get a bit dry for about 2 hrs in shade. Test by taking a handful and crushing it in your fist, it should get crushed to smaller bits. Now it's ready to be ground in the dry grinder of your mixie. You can use ready made rice flour too if available. grind everything together with minimal water . grind everything together with minimal water. ingredients for the outer shell ..
To make the whole wheat dough you just mix whole wheat flour n rice flour in equal amounts, add salt to taste and make a medium soft dough by adding appropriate amount of water. Adding the rice flour to the wheat dough makes the fara have a nice bite, and it is more moist even when cold. first of all measure 2 cups of water and salt to taste (for 1 cup of flour) and boil the water covered in a pateela or preferably handi. Don't use a wide pan here. Click to enlarge the image below to read instruction on it. As soon as the water comes to rolling boil open the lid and pour the rice flour at once and cover the lid immediately. Do not stir the mix and let it cook for 4-5 minutes or till the water spills off a little. Check that the rice flour lump will look glazed, it reveals rice flour in powder form when poked but that is how it needs to be. Take the pot off the flame. Now use a large fork or a sturdy ladle or a wire whisk to mix it vigorously. It may appear lumpy first but be patient and add more rice flour if it's too sticky, don't worry about the lumps as you have to knead it with hands once it is cold enough to handle. Knead with your hands when it is cool enough to handle. Make a pliable medium soft dough which you can roll easily, more rice flour can be added but the dough should become smooth. You can oil your hands while doing it. I make them in different sizes and shapes and I prefer filling urad dal mixture in the rice dough and the chana dal mixture in the wheat dough. You are free to have your own combination . The bigger faras take less time to assemble but more time to cook, I prefer slicing them and frying them for a nice crunchy tea time snack. 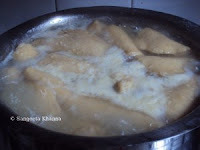 There are two ways to cook the fara or goojha, you can either steam them over a steamer plate or boil them in lots of water like you boil pasta. The steaming over a porous plate is explained in the collage above. And boiling in a wide pot with lots of water is explained below. While you are shaping the faras, boil water (with a little salt and a tbsp of oil) in a big wide pateela, when the water starts boiling slip the faras into it taking care not to scald yourself. All the dumplings will be submerged in water at once, but they will start coming up as soon as they start cooking. Let it cook for another 3-7 minutes after they float on the surface, 3 minutes for the smaller ones and 7 minutes for the bigger daddies. Take out one of them and prick with a pointed knife, if it comes out clean it's cooked. They can be served right away if you want them steamed and it makes a filling satisfying and yummy dinner. I have fond memories of having a large platter of these on the dining table, just out of boiling water and all of us sitting and eating them as if there is no tomorrow. This time I halved one of the bigger ones and had it just when the second batch was cooking. It has such a wonderful bite, the covering is a perfect wrap for a soft crumbly spicy filling, a bite into the doughy shell leads to aromatic spicy interiors. A perfect alternative to daal roti, healthier and exotic desi. I don't even need a chutney with it I like it so much. A green chutny or even a sonth chutny is a great accompaniment, but I prefer making the filling spicy and no accompaniments whatsoever. Yeah it is a different story with the fried ones. I generally fry the refrigerated ones, you know I make them for a week as I can't have enough of them in one go. 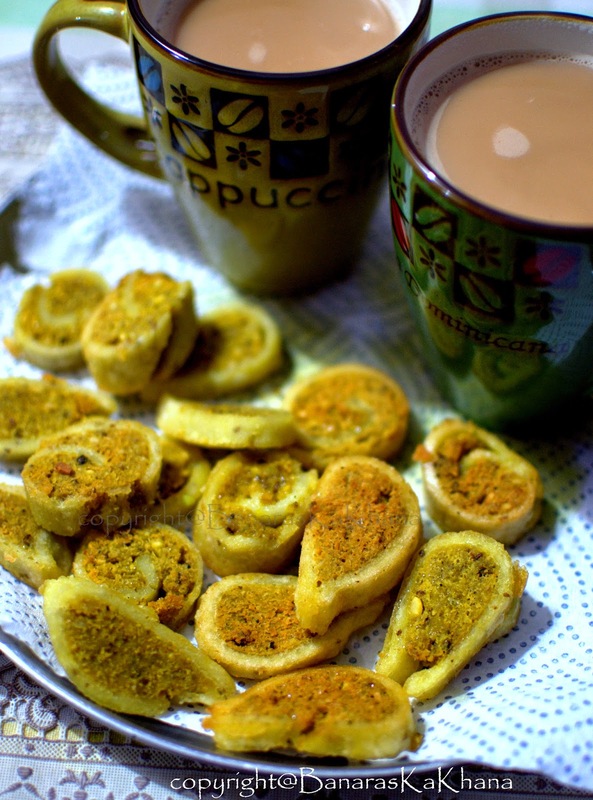 It keeps very well in the fridge and you can fry the smaller ones whole and the bigger ones can be sliced and fried to make exotic tea time snacks. They don't absorb oil and as you drain them on tissue paper any oil clinging to the surface is also absorbed by the tissue. We had these for the evening tea. The covering becomes a bit hard and crunchy after frying, without taking any oil and we love it. It is after years that I have made them, though I was thinking of making these for a long time. Ravioli pasta and other types of dumplings I used to make a lot but these fara (goojha) brought many memories along and that made the meal even more special. 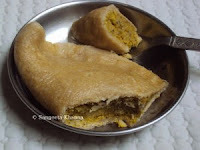 PS : In our home it is called goojha as it is shaped like a gujhia. 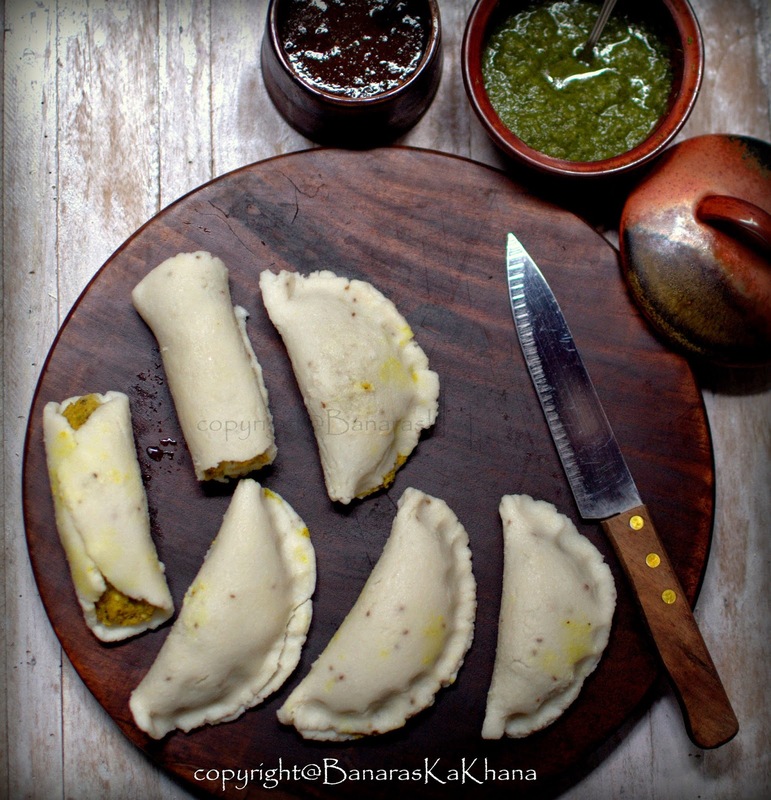 I have seen many people in banaras call it fara and bengali friends and a few bihari friends call it peetha. Now this anonymous reader has come up with another name, gointha. It was great to know this name and hilarious too, as gointha is a name for cow dung cakes used as fuel in the rural areas. They are made into the same shape and may be the name is inspired by that. What's in a name when the end product is so yummy. You make it for a week and enjoy it any way you like Warm it with a sprinkling of water in microwave and enjoy it steamed for dinner with a soup may be, or fry them for a snack. A blogger friend says that the best way to learn is to share your knowledge. I experienced it when I shared the recipe of patode. I knew only about the gujrati patra till now and after posting the recipe I came to know about the konkani and mangalorian pathrode as well. Many of your comments indicated that there are so many versions of this recipe and it is so heart warming to see this diversity with the same ingredients. I am sure that I will be knowing many more types of peethe too now, I know there is a different version in almost every state of India. But I have known only about the bengali peethey so far. What about your kind of peethey or any such dumpling ?? Had you known this Fara or goojha? Or you also know it as pitha or peetha? Come on tell me. Iwelcome your links too if you have posted the recipe already on your blogs. Hello sangeetha, thanks for stopping by my blog and for the lovely comment. This is totally new to me. Love traditional recipes and ur step by step pics is very helpful. Thanks a lot for including tips on making rice dough.I have to try it now. 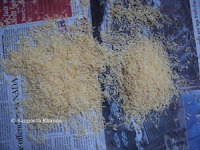 Do you think readymade rice flour can be used? I remember rolling it out thinner as 2 - 3 cm would be around an inch thick.What do you think? very interesting and a new to me recipe. yes, cooking the foods you grew up with is so nostalgic, isn't it! lovely yummy and tempting with step by step demo.Thanks for sharing. @ anonymous..... WHY ANONYMOUS ?? ready made rice flour is good too , i made it at home cuz i don't get it around my place. Yes it is thinner and 1 cm is the actual thickness , i have corrected that and thanks for this reminder. It looks every bit delicious for all the effort you have taken! Peetha looks yummy. Thanks for sharing step by step recipes with us. Wow....that looks tempting and delicious. sounds health as u r boiling it in water.. hows the taste, when u boil in water..
if you are wondering about how it tastes , think about a hearty pasta ...and some masala...it's pretty close . I'd like to know about the sweet version you guys make , give me links if you have seen it somewhere . this seems so tough, but worth the effort..
अपने तो मुंह में पानी आ गया..गुजिया लोग केवल होली में ही क्यों खिलाते हैं..! wow....finally I got another blogger who knows this dish....the UP vaale faare! :)I like them with aaloo jhol! I love these but dont make them very often coz its a length procedure. Lovely Blog...identify with your recipes & post. Do visit meine smtime & wish to keep in touch! 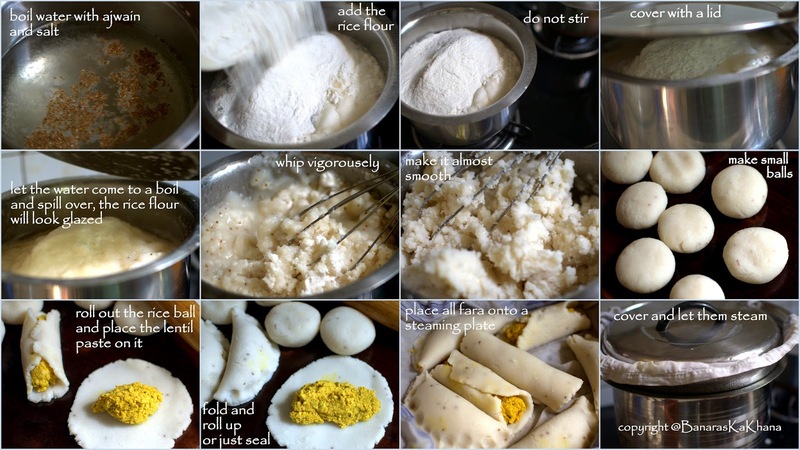 Hey Sangeetha, this is a nice recipe love the detailed descriptions here... Shall make them some time I dont recollect anything that had a rice dough, gotta check with Mom... Awesome pics and have book marked them... thanks for bringing them to my notice!!! Many of my recipes here belong to the eastern parts of UP and some are punjabi. But i mostly post traditional food here that's why you find it homely .....a great complement actually.. Please let me know whenever you try something.. I ate something very similar in Manali. Cannot recall the name. Have tasted this too. One of my friends used to get it and I wanted the recipe. Thanks a lot for sharing. I love fare.....this is my favorite..ur step by step presentation is very good. 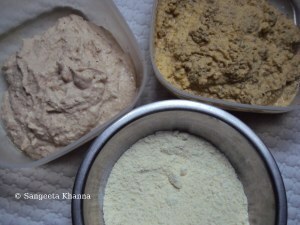 Ilike ur blog and love to follow u.
I remember hearing of Phara in my childhood but never got an opportunity to taste it. now, I am gonna try it and would surprise my mom with it when she visits me. hi sageeta :) ... do you have the recipe of indrahr? a dish made of urad dal and some spices? looking for that for long. Hi Karuna ..indrahar is made with mixed lentils and i have a similar recipe made with soaked chana daal ..here is the link .. Follow this recipe with any mix of lentils and any kind of spice mix you like...i experiment with this recipe a lot as it is a very forgiving one. Hey!! V UP walahs are sure 2 have dese on karwa chauth. N now dat m also married, i was also supposed 2 prepare dese! Imagyn my situation..i h8 cuking, n my in-laws knew nothng abt dis dish (dey r rajasthanis). Bt i did prepare dem...it was very scary 4 me initially, bt hey! its real easy 2 cuk dese. N v back in UP call it Farra Dutta. Rice flour ko roll kar k uska finger shape me steamed form bhi baut tasty lagta hai, esply wen u fry it the next day. Do try. N farra, try eating it wid UP spl aalu matar ka jhol! I have never tried it with aloo matar as at our place it was eaten with lots of coriander/mint chutney. Also i have never known it to be a karva chauth recipe...karva chaith is pakwaan ( plain mathhi) and halwa at our place. Farahs are made by us on the day of karwa chauth..we make it and have it after breaking the fast with lehsun chutney and melted ghee( dollops of it)...they are a treat..I steam them( in teh idli steamer) instead of boiling it and they come out just fine. 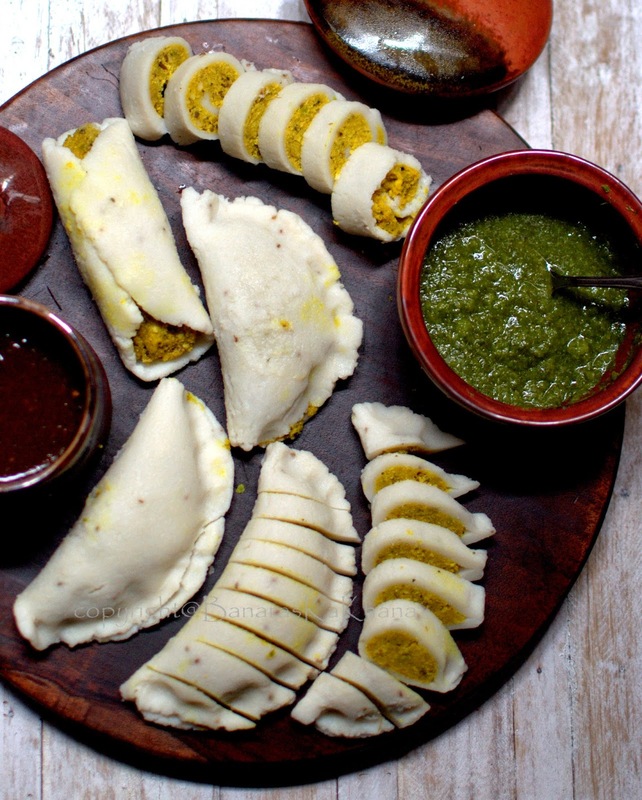 Hi Sangeeta, thanks for such a delicious recipe. I tried this recipe over the weekend. I have been meaning to try it since long but was intimated by the long procedure. I made it twice:once steamed and second time I just pan fried the steamed ones. Served with hari chutney. Loved it. Thanks for the great traditional recipe. Thanks for letting me know about it Mini. I am so glad you could follow the recipe of Fara even though it is a little elaborate. Happy that you liked it too.